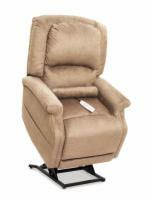 The PR-756 Relaxer further upgrades the MaxiComfort lift chair recliner with extra thick padding and pillow back cushions. In combination with the Relaxer's infinite-position recline mechanism, relaxation becomes a reality in this lift recliner. The Relaxer is backed by a 7-year pro-rated warranty and can be upgraded with Brisa Ultra Fabrics and a heat and massage unit. Our Recommendation: For our customers looking for the ultimate in comfort and who prefer deep, plush cushions, we often recommend this liftchair. If you can afford to spend a little more for long term comfort, then this is a great choice. For more information on the PR-756 Relaxer, call 1 (800) 791-6814 to speak with a lift chair expert.